Start instruNet World software multiple times and get different responses. Perhaps in some cases it works ok.
Start instruNet World software with Terminator connected and it does not work, and then start it with terminator Off and it does work. Swap out different elements within the system, yet no 1 element seems to be the cause of the problem. It appears that multiple elements might be bad. If your system matches any of the above descriptions, then you can use an ohm meter to check the 25 wire cable chain, to look for a bad wire. This could be in a cable (e.g. Db25m-to-Db25f, i300-Power-Adaptor) or a device (e.g. i100, i410). 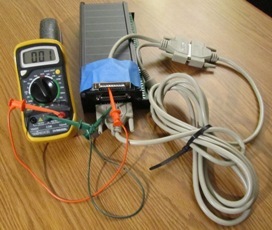 In the case of the device, an internal Printed Circuit Board (PCB) connects 14 out of the 25 pins along the cable chain. instruNet systems included an i2x0 controller, Db25 cables, 1 or more Devices (i100 or i4xx) and then possibly a terminator at the end. 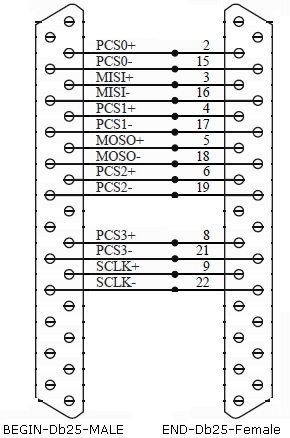 14 of the 25 pins in this cable chain should be connected between the i2x0 controller and the terminator (e.g. pin #2 at i2x0 controller is electrically connected to pin #2 at terminator). 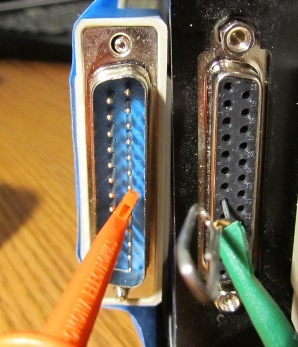 The Db25male connector on the cable that attaches to the i2x0 controller is referred to the "BEGIN-Db25-male". The Db25 connector on the last i100/i4xx Device that possibly attaches to a terminator is referred to as the "END-Db25-female". Attach together in one big chain all of your Db25 cables, all of your i300 cables, all of your i4xx devices and all of your i100 devices. Do not include: i312 power supplies, i330 isolators, terminators and i2x0 controllers. Do not apply power. Do not connect the i2x0 controller or the Terminator. The photograph below shows how to probe the two connectors. Notice that a paper clip is used to gain access to female pins. Also notice that these 2 connectors are mirror images of each other (i.e. right column on BEGIN connector corresponds to left column on END connector in below photo). The below photo shows this ohm meter check being performed on an i300-Power-Adapter-Cable, Db25-3meter cable, and one i100 box. Notice that a piece of tape is used to hold the BEGIN and END connectors next to each other, to make it easier to keep track of the pins. Applying a strong lamp to these connectors is also helpful. If you see 1 bad wire, then that is definitely a problem. If this occurs, then break the long chain into 2 segments and test that 1 wire on both segments to see which segment has a broken wire. Keep breaking the segments into smaller segments until you identify the bad piece of hardware.